- NOAH vs. New Japan: Takashi Sugiura and Go Shiozaki vs. Nakamura and Milano Collection A.T. This is an Enhanced Review, so expect more pictures and more analysis. Let's get started. Marufuji and Richards start things off. Tie-up, and they trade elbows then boots, wristlock by Richards but Marufuji flips out of it and reverses the hold. Richards kicks Marufuji away however and both wrestlers return to their feet. Richards tags in Strong, Irish whip by Strong but Marufuji shoulderblocks him down. Marufuji goes off the ropes, he rolls up Strong but it gets a two count. Armdrag by Strong and they trade pin attempts with neither getting move then a two count. Marufuji tags in Aoki, wristlock by Aoki, Strong gets out of it however and slams Aoki to the mat. Headscissors by Aoki but Strong gets out of it, elbow by Aoki but Strong chops him hard in the chest. Strong chops Aoki into the corner, Irish whip, but Aoki delivers a heel kick. Aoki tags in Taue so Strong tags in Buchanan. Buchanan and Taue go into a Test of Strength, wristlock by Taue and he hits a back kick. Irish whip by Taue, reversed, and Buchanan hits a lariat in the corner. Buchanan tags in Richards, Richards goes for a vertical suplex but Taue blocks it and tags in Marufuji. Snapmare by Marufuji, he goes off the ropes, springboards himself over the top rope to the apron and quickly swings around to kick Richards between the ropes in the chest. Marufuji twists Richards's neck with his feet before making the tag to Aoki. Irish whip by Aoki and he delivers a dropkick for a two count cover. Richards drives Aoki back and tags in Strong, Strong throws Aoki in the corner and chops him in the chest. They trade blows, but Strong gets the better of it, Irish whip by Strong but Aoki elbows him as he charges in. He goes for a missile dropkick by Strong moves out of the way and rolls him up for a two count. Irish whip by Strong and he connects with a dropkick, cover, but it gets a two count. Slingshot Falcon Arrow by Strong, cover, but Aoki kicks out. Strong picks up Aoki but Aoki reverses a suplex attempt with a crucifix roll-up for a two count. They trade holds on the mat but Aoki applies the Fujiwara Armbar. Strong gets out of it and charges Strong, but Strong hits an enzigieri. Heel kick by Aoki, he charges Strong and delivers an elbow followed by a Northern Lights Suplex for a two count. Suzuki and Marvin start things off. Marvin charges Suzuki and the two trade blows, Irish whip by Marvin, reversed, but Marvin delivers a springboard hurricanrana. Marvin charges Suzuki, Suzuki catapults him over his head but Marvin lands on the top rope and comes back with another diving hurricanrana. Suzuki rolls out of the ring, Marvin goes off the far ropes and sails out onto him with a somersault tope suicida. Suzuki gets back in the ring, Marvin picks up him and slams him to the mat before tagging in Takayama. Suzuki tags in Rikio, Rikio and Takayama tie-up, Rikio pushes Takayama into the ropes and elbows him in the head. Takayama returns fire and they trade elbows, Takayama tries to throw Rikio to the mat but Rikio reverses it and it is Takayama that goes down. Takayama quickly gets back up and the two collide with no result, Takayama goes off the ropes and again Rikio stands strong. Now Rikio goes off the ropes when Takayama does and Rikio shoulderblocks Takayama to the mat. Takayama slowly returns to his feet, wristlock by Rikio, Takayama gets in the ropes but Rikio rakes him in the eyes and tags in poor Suzuki. This wasn't a good idea. Snapmare by Suzuki and he applies a reverse chinlock. Takayama kicks out of it however and slams Suzuki to the mat before tagging in Marvin. Marvin comes in the ring and gives Rikio a rope-running dropkick, which pisses off Rikio and Rikio charges into the ring. Rikio throws Marvin out of the ring, Rikio goes outside as well and throws Marvin into the railing before slamming him into the mat. He then quickly gets on the apron and jumps down onto Marvin with a double stomp before rolling him back into the ring. Pissed off Rikio is awesome. Cover by Suzuki to Rikio but he kicks out at two. Suzuki tags in Rikio, Rikio picks up Marvin, Irish whip to the corner and he delivers a running lariat. Cover, but it gets a two count. Rikio picks up Marvin and slams him to the mat, he then picks him back up and tags Suzuki back in. Stomps to the lower back by Suzuki, Suzuki picks up Marvin and connects with the back kick for a two count. Crab hold by Suzuki but Takayama breaks it up. Yone and Morishima trade elbows to start the match, Yone goes off the ropes but Morishima shoulderblocks him down. Dropkick by Morishima, and Yone falls out of the ring. Morishima goes off the far ropes but gets tripped from the floor, and Hirayanagi brings a chair into the ring. Hashi comes in the ring and grabs Hirayanagi and pulls him back outside, Hirayanagi comes back in after Morishima but Morishima throws him out of the ring and then sails out onto all three of his opponents with a plancha suicida. Morishima returns to the ring but outside the ring Yone and company re-gain control as the match finally takes a normal structure with Yone coming into the ring to face off with Morishima. Kick to the leg by Yone and he tags in Kanemaru. Kanemaru picks up Morishima and he goes for a suplex, but the fat man blocks it and gets into the ropes. Elbows by Kanemaru, Irish whip, reversed, Kanemaru goes for a sunset flip, Morishima blocks it but Kanemaru hits him low and delivers the vertical suplex for a two count. Morishima tags in Hashi while Kanemaru tags in Hirayanagi. Hashi and Hirayanagi circle each other, wristlock by Hirayanagi but Hashi reverses it. Hirayanagi pushes Hashi to the mat and clubs him in the back, but Hashi returns to his feet and the two trade blows. Eye rake by Hirayanagi and he tags in Yone. Irish whip by Yone to Hashi and he kicks him in the chest. More kicks by Yone and they trade strikes after Hashi returns to his feet. Mongolian chops by Hashi, Irish whip, and he clubs Yone in the chest. Hashi tags in Ito, Irish whip by Ito and he connects with the dropkick. Ito knocks Kanemaru off the apron and goes after him outside the ring, but Kanemaru gains the advantage and throws Ito into the railing. A brawl starts outside the ring with people not even in the match, with Kotaro Suzuki beating up Aoki. Back in the ring Yone and Ito are still fighting, as Yone hits a vertical suplex and tags in Hirayanagi. Hirayanagi throws Ito out of the ring where Kanemaru throws him into the railing, kicks him in the head, and then gives him a double stomp. He then scoop slams him into the floor before kindly rolling him back into the ring. Irish whip by Hirayanagi to Ito and he hits an elbow, cover, but it gets a two count. Hirayanagi applies the camel clutch, but Ito gets a foot on the ropes and he breaks the hold. Hirayanagi tags in Yone, scoop slam by Yone and he delivers a leg drop before applying the neck crank. Kanemaru then runs in and dropkicks Ito in the head, cover by Yone but it gets a two count. Yone picks up Ito, Irish whip to the corner and he hits a lariat. Second turnbuckle leg drop by Yone, cover, but Ito gets a shoulder up. Yone picks up Ito, Ito starts to fight back, Yone absorbs the blows but when Yone goes for a kick Ito catches it and hits a dragon screw leg whip. Post match: Everyone brawls. For several minutes. Especially Suzuki and Aoki. And its fun. Williams and Ogawa start things off. Tie-up, Williams pushes Ogawa into the ropes and he gives a clean break. Tie-up again, this time Ogawa gets Williams into the ropes but he gives a clean break as well. They tie-up once more, this time with Williams getting the better of it with a cross-armed choke, but Ogawa reverses it. Waistlock by Ogawa, reversed by Williams, but Ogawa dumps Williams out of the ring. Williams returns, Ogawa trips him but Williams gets a side headlock applied. They trade holds, arm drag by Ogawa and both men return to their feet. Side headlock takedown by Williams, reversed into a headscissors by Ogawa, but Williams does a handstand to get out of it. Williams grabs Ogawa's ankle but Ogawa kicks him off. Williams tags in Saito while Ogawa tags in Taniguchi, Saito and Taniguchi tie-up but Saito gives a clean break in the ropes. Tie-up again, Taniguchi pushes Saito into the ropes and gives him an elbow before backing off. Taniguchi and Saito trade elbows, Taniguchi goes off the ropes and a running elbow sends Saito to the mat. Back up they tie-up, Taniguchi pushes Saito back and makes the tag to Misawa. Bison asks for the tag and gets it, Bison and Misawa tie-up, Bison pushes Misawa into the ropes but he gives a clean break. Back in the middle of the ring they trade elbows which Misawa gets the better of, sending Bison crashing to the mat. Misawa tags in Ogawa, they give Bison a double Irish whip and elbows him in the stomach. They then give Bison a double vertical suplex followed by a double elbow drop, cover, but it barely gets a two count. Irish whip by Bison onto Ogawa and he delivers a spinning side slam backbreaker. Bison tags in Williams, Williams picks up Ogawa and hits an uppercut. Scoop slam by Williams and he drops a knee onto Ogawa, cover, but it gets two. Headscissors by Ogawa but Ogawa gets out of it and makes the tag to Misawa. Williams and Misawa tie-up, hammerlock by Williams but it is reversed. Williams gets Misawa to the mat and applies a bow and arrow submission but Misawa gets out of it and Williams rolls out of the ring. Misawa tags in Taniguchi as Williams returns, takedown by Williams and he tags in Saito. Saito clubs Taniguchi in the back and kicks him in the chest, Irish whip by Saito and he knees Taniguchi in the stomach. Saito picks up Taniguchi and he delivers a delayed vertical suplex, cover, but it gets a two count. Lariat by Saito, he quickly picks up Taniguchi and hits a backdrop suplex. Cover, but Taniguchi barely gets a shoulder up. Saito tags in Bison, lariat by Bison and he throws Taniguchi into the corner. Snapmare by Bison and he applies a reverse chinlock. Taniguchi gets to the ropes to force a break, and Bison tags in Williams. Uppercut by Williams, Taniguchi tries to fight out of the corner but Williams applies a headscissors and drops a knee onto Taniguchi for a two count cover. Williams dumps Taniguchi out of the ring, and outside Saito throws him into the guard rail. Saito throws Taniguchi into the ring post, then Bison holds Taniguchi against the post so that Saito could deliver a lariat. Saito slides Taniguchi back into the ring, cover by Williams but it gets two. Williams tags in Bison, clubs to the back by Bison onto Taniguchi and he delivers a powerbomb. Cover, but it is broken up by Misawa. Misawa and Ogawa give Bison a double Irish whip but he lariats both of them to the mat. Bison tags in Saito, clubs to the back by Saito and he kicks Taniguchi in the chest. More kicks by Saito, Taniguchi absorbs the blows and hits a few elbows, but Saito levels him with a lariat for a two count cover. Saito tags in Bison, Bison puts Taniguchi onto the top turnbuckle, he then applies the Iron Claw on the top turnbuckle. Taniguchi gets out of it by tossing Bison to the mat, which gives him time to tag in Misawa. Irish whip by Misawa to Bison and Misawa hits an elbow followed by a senton. Misawa picks up Bison, Irish whip to the corner, reversed, but Misawa elbows Bison when he charges in. Misawa goes off the ropes but Bison catches him with a powerslam. Bison then goes up to the top turnbuckle and hits a diving shoulderblock, cover, but it gets a two count. Back up, Bison applies the Iron Claw, Misawa gets out of it but Bison lariats him to the mat. Takashi Sugiura and Go Shiozaki vs. Shinsuke Nakamura and Milano Collection A.T.
Back to goodness. Sugiura and Nakamura start things off and quickly begin trading elbows. Irish whip by Sugiura but Nakamura avoids the boot and gives Sugiura one of his own. Sugiura comes back with a spear however as both men return to their feet, takedown by Nakamura and they jockey for position on the mat. Sugiura goes for the ankle but Nakamura rolls out of it and goes for the ankle as well. They roll towards the ropes with Nakamura getting the break, and both men are back up. Tie-up, Sugiura pushes Nakamura towards the ropes but Nakamura tags in Milano. Wristlock by Milano to Sugiura and he applies an armbar on the mat. Hammerlock by Milano and he goes back to the wrist, but Sugiura slams him to the mat and tags in Shiozaki. Shiozaki. and Milano circle each other, Milano ducks Shiozaki. 's attacks and applies a side headlock. Shiozaki. Irish whips out of it and the two collide with no result. Milano goes off the ropes again and ducks a Shiozaki. punch, again he goes off the ropes but Shiozaki. shoulderblocks him to the mat. Shiozaki. picks up Milano and gives him a chop followed by a scoop slam and knee drop for a two count cover. Reverse chinlock by Shiozaki. and he chops Milano in the chest. Shiozaki. goes off the ropes but Milano rolls out of the ring to re-group. Shiozaki. goes out after him but Milano quickly slides back into the ring, and Milano kicks Shiozaki. as he tries to climb through the ropes. Milano ties Shiozaki. up in the bottom rope and dropkicks him in the head, and Nakamura throws in a kick of his own for extra measure. Milano picks up Shiozaki. and makes the tag to Nakamura, Nakamura elbows Shiozaki. in the corner but Shiozaki. comes back with a chop. The two trade blows with Nakamura getting the better of it with a kick to the chest, Irish whip by Nakamura and he delivers a heel kick. Cover, but Shiozaki. kicks out at one. Nakamura picks up Shiozaki., he goes for a scoop slam but Shiozaki. reverses it with a Dragon Sleeper. He breaks it up when Milano runs in the ring, which gives Nakamura time to recover. Nakamura charges Shiozaki. in the corner, Shiozaki. kicks him back and goes up to the top turnbuckle, but Nakamura kicks Shiozaki. down over the ropes to the floor. Nakamura goes outside the ring but Sugiura greets him, but Milano comes over and attacks Shiozaki. Nakamura rolls back into the ring while Milano continues attacking Shiozaki. on the floor, but he finally rolls Shiozaki. back in. Nakamura stomps on Shiozaki. and goes after the leg, which had been slammed by Milano into the railing a moment earlier. Nakamura tags in Milano, Milano and Nakamura both grab Shiozaki. 's legs and yank on them. Leg lock by Milano, Shiozaki. starts to fight back but Milano regains the advantage and tags in Nakamura. Elbow to the leg by Nakamura but Sugiura comes in the ring, elbowing Nakamura repeatedly in the head. Sugiura knocks down Nakamura with a shoulderblock, but Nakamura recovers before Shiozaki. and connects with a few elbows. Shiozaki. comes back with a chop and the two trade blows. Nakamura goes off the ropes but Shiozaki. catches him with a chop, but Nakamura boots him back. Nakamura goes off the ropes again but he is caught with a superkick. This gives Shiozaki. time to tag in Sugiura, who spears Nakamura and knocks Milano off the apron. Sugiura picks up Nakamura but Milano comes in the ring, double Irish whip to Sugiura but Sugiura spears Milano and then slams Nakamura to the mat. Running boot in the corner by Sugiura, and he connects with two more. German suplex hold by Sugiura, but Nakamura kicks out at two. Irish whip by Sugiura but Nakamura delivers a back kick. Nakamura goes off the ropes but Sugiura kicks him back, Sugiura goes off the ropes but Nakamura hits a powerslam. Inverted powerslam by Nakamura, cover, but it gets a two count. Nakamura picks up Sugiura and puts him on his shoulders, but Sugiura gets off and drops Nakamura on his head with a release German suplex. Sugiura goes for a running kick but Nakamura ducks it and hits a release German suplex of his own. Both wrestlers are slow to get up, and they trade elbows once they return to their feet. Slaps by Sugiura, but Nakamura returns with a hard right to the face, getting loud boos from the audience. He goes for a second punch by Sugiura knocks him down with a lariat. Sugiura is up first and tags in Shiozaki., Shiozaki. knocks Milano off the apron and goes back to Nakamura. Nakamura and Shiozaki. trade strikes, Irish whip by Shiozaki. from the corner and he delivers a running chop. Kicks to the chest by Nakamura, but Shiozaki. catches one and clubs Nakamura in the chest. Irish whip attempt by Shiozaki. but Nakamura slams on the breaks and applies a triangle choke. He goes for the cross armbreaker, but Shiozaki. keeps his hands locked until Sugiura can save him. Nakamura gives Sugiura a pair of high kicks and makes the tag to Milano. Milano and Shiozaki. trade chops, double Irish whip by Nakamura and Milano and both hit strikes on Shiozaki. in the corner. Face crusher by Milano and he nails Shiozaki. with a superkick. Cover, but Sugiura breaks it up. Nakamura throws Sugiura out of the ring, Milano picks up Shiozaki. and goes for the Victoria Milanese, Shiozaki. reverses it and goes off the ropes, but Milano avoids Shiozaki. 's attack. Irish whip by Milano but Shiozaki. reverses it and delivers a Fisherman Buster. Shiozaki. goes up to the top turnbuckle but Milano protects himself with the referee, and then gets up and goes for a powerbomb, but Shiozaki. reverses it with a hurricanrana. Milano and Shiozaki. trade blows, but Shiozaki. nails a lariat for a two count. Shiozaki. picks up Milano with Sugiura, double Irish whip to the corner, chop by Shiozaki. and Sugiura holds Milano on his shoulder so that Shiozaki. can hit a diving knee drop to Milano's chest. Cover by Shiozaki. but Nakamura breaks it up. Nakamura kicks Shiozaki. in the chest and goes for the Landslide onto Sugiura, but Sugiura slides down his back and delivers the Olympic Slam. Milano and Shiozaki. are back up trading blows, superkick by Shiozaki. and he delivers another one with Milano on his knees. Lariat by Shiozaki., but Milano barely gets a shoulder up. Shiozaki. picks up Milano and goes for a lariat, but Milano ducks it. Enzigieri by Milano and he hits a backslide, but Shiozaki. gets out of it. Small package attempt by Milano, but Shiozaki. rolls through it and nails the Go Flasher. Lariat by Shiozaki., cover, and he picks up the three count! Your winners: Takashi Sugiura and Go Shiozaki. 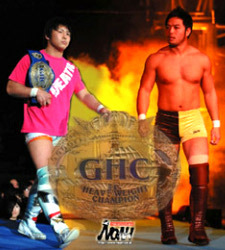 This match is for the GHC Jr. Heavyweight Championship. They trade elbows to start the match, KENTA goes off the ropes and hits a boot but so does Nakajima. They trade kicks, KENTA goes off the ropes and Nakajima goes for a leapfrog, but KENTA kicks him in the face. Snapmare by KENTA and he tries to kick Nakajima in the chest, but Nakajima ducks it. They trade kick attempts and then both kick each other in the face, sending them reeling into opposite corners. Tie-up, Nakajima pushes KENTA into the ropes and he chops him before backing off. They trade chops, Irish whip by KENTA and he delivers a running boot to the face. KENTA picks up Nakajima and throws him into the corner, Irish whip, but Nakajima kicks him when he charges in. Nakajima goes off the ropes but KENTA catches him with a heel kick. Cover, but it gets a two count. Side headlock by KENTA but Nakajima gets a foot on the ropes. KENTA pulls Nakajima to the middle of the ring and applies a camel clutch, but he releases the hold to kick Nakajima in the back. Nakajima catches a KENTA kick and pushes him into the ropes, and he kicks Nakajima in the chest. The two trade kicks, but Nakajima hits a dragon screw leg whip to gain the advantage. Nakajima picks up KENTA and kicks him in the chest again, Irish whip from the corner, reversed, but Nakajima moves when KENTA charges in, bailing to the apron. KENTA tries to kick Nakajima while he is on the apron but Nakajima catches his leg and delivers a dragon screw leg whip. Outside the ring Nakajima kicks Nakajima in the leg, he picks up KENTA and slides him back into the ring. KENTA follows him in and kicks him in the leg some more before applying a leg lock. KENTA gets to the ropes after a moment and returns to his feet, KENTA goes for a kick but Nakajima catches it and hits another dragon screw. Nakajima stomps KENTA in the knee, he picks him up and drapes his leg over the second rope so he could kick it some more. KENTA gets himself free and the two trade leg kicks, which Nakajima gets the better of. Leg lock by Nakajima but KENTA makes it to the ropes. Irish whip by Nakajima from the corner, but KENTA kicks Nakajima back when Nakajima charges in. KENTA runs at Nakajima but Nakajima dropkicks KENTA in the knee. KENTA gets back to his feet, kick to the leg by Nakajima and an Irish whip, but KENTA hits a flying elbow followed by a pair of lariats. Vertical suplex by KENTA, he goes up to the top turnbuckle and delivers a diving lariat for a two count. KENTA picks up Nakajima and goes for a backdrop suplex, but Nakajima lands on his feet. Kicks by Nakajima but KENTA returns fire, sending Nakajima back in the corner. Running boot by KENTA but Nakajima comes back with one of his own. Back kick by Nakajima in the corner and he delivers a running dropkick to the face as KENTA sits on the mat. Nakajima pulls KENTA out of the corner and hits a snap suplex followed by a DDT. Missile dropkick by Nakajima, cover, but it gets a two count. Nakajima picks up KENTA and goes for a suplex, but KENTA blocks it and puts Nakajima onto the top rope. Kicks to the chest by KENTA, he goes up to the top turnbuckle and goes for a knee drop, but Nakajima moves out of the way and delivers a slingshot doublestomp. Nakajima then runs in the ring and dropkicks KENTA under the bottom rope to the floor. Nakajima goes outside as well and Irish whips KENTA into the guard rail. Nakajima then picks up KENTA and drops him leg-first onto the railing at ringside. Back up, Nakajima throws KENTA into the ramp before going up there himself. He goes to grab KENTA who is still standing on the floor leaning against the ramp, but KENTA gets Nakajima onto his shoulders and slams Nakajima to the floor. KENTA returns to the ring with Nakajima slowly following, and KENTA knocks him back with a springboard dropkick. Running kicks by KENTA in the corner and he nails a sit-down powerbomb. Cover, but it gets a two count. KENTA applies an STF but Nakajima makes it to the ropes. KENTA goes for a suplex, Nakajima elbows him off, but KENTA hits a powerslam for a two count. KENTA picks up Nakajima but Nakajima gets out of the suplex attempt and both wrestlers go for dropkicks. Ankle lock by Nakajima but KENTA quickly gets to the bottom rope. Back kick and a scissors kick by Nakajima, but KENTA comes back with a kick of his own. Tombstone by Nakajima and he kicks KENTA in the back of the head. Cover, but it gets a two count. This match is for the GHC Heavyweight Championship. They lock-up to start the match but break cleanly. Takedown by Sasaki but Akiyama applies a front facelock. Sasaki gets out of it and both men return to their feet, they go into a Test of Strength which is won by Sasaki. Sasaki pushes Akiyama into the ropes but he gives a clean break. Tie-up, side headlock by Sasaki, Akiyama Irish whips out of it but Sasaki shoulderblocks him down. Tie-up, Sasaki pushes Akiyama into the ropes and gives a clean break, but Akiyama elbows him and tackles Sasaki to the mat. Sasaki returns to his feet and the two trade strikes, Irish whip by Sasaki to the corner but Akiyama boots him as he charges in. Chop by Sasaki but Akiyama comes back with a jumping knee, sending Sasaki out of the ring. Akiyama then gets up on the top turnbuckle and sails out onto Sasaki with a plancha suicida. Akiyama gets back in the ring first with Sasaki slowly following, Akiyama applies a sleeperhold into a front facelock, but Sasaki gets into the ropes. Akiyama kicks Sasaki down in the corner, he charges Sasaki and delivers a running knee strike. Akiyama picks up Sasaki, snapmare, and he applies a headscissors. Sasaki eventually gets to the ropes to force a break, he returns to his feet and the two exchange blows. Akiyama gets the better of it with a knee and he stomps on Sasaki as he is getting back up. Sasaki absorbs the blows it and gets up anyway, then then back bodydrops Akiyama to the mat. Backdrop suplex by Sasaki and he delivers a lariat followed by a second one. Akiyama falls to the outside, but Sasaki goes out after him and chops him on the floor. Sasaki tries to Irish whip Akiyama into the railing, but Akiyama reverses it. Akiyama gets back on the apron but Sasaki recovers and throws Akiyama from the apron throat-first into the guard rail. Sasaki gets back into the ring with Akiyama very slowly following, Sasaki goes off the ropes and levels Akiyama with a lariat. Sasaki throws Akiyama back to the floor and hits a vertical suplex. Sasaki rolls Akiyama back in the ring and joins him, Sasaki goes off the ropes and knocks down Akiyama with a lariat. Cover, but it gets a two count. Best Match: Takashi Sugiura and Go Shiozaki. vs. Shinsuke Nakamura and Milano Collection AT. Once again the NOAH vs. New Japan feud just brings it, and this match had it all... a hot crowd, big moves, and intensity. Milano being in the match took it down a bit as he isn't the level of wrestler as the other three, but to his credit he really held his own and looked like he belonged. Hopefully this feud will continue as it really seems to inspire the wrestlers to put on an intense and exciting match. MVP: Takashi Sugiura. In the best match on the card, Sugiura gave the best performance as he defended NOAH against the invaders. The crowd was solidly behind him and even though Shiozaki. picked up the pinfall it was Sugiura that had the most memorable performance. Overall: This event was a huge improvement over what I saw from NOAH in 2008. One can never underestimate the value of having defined heels and faces. Not only does it make the crowd more excited, but for some reason the wrestlers fight with more fire and energy when they have a purpose in the match. With three matches with Kensuke Office vs. NOAH, two with defined heels and faces, and one New Japan vs. NOAH match there were lots of reasons for the crowd to stay into it. Not all the matches were great as there was still a slow lackluster multi-man match and the main event was disappointing, but overall I'd recommend this event as a good place to start again if you haven't watched NOAH in awhile.